The Fuji Frontier 390 processor produces digitally mastered prints on traditional photo paper. Virtually all consumer photos are being digitally mastered these days. Aardenburg Imaging has now acquired print samples and started light fade testing on three systems that represent current consumer photo printing choices for 2008. Now in test are samples of Fujifilm Crystal Archive II photo paper printed on a Frontier 390 “wet” minilab and samples made on the new Fujifilm 400 DL “dry” minilab. The Frontier 390 utilizes traditional RA-4 compatible silver halide photo chemistry, whereas the DL 400 employs dye-based inkjet inks and media. Also in test are samples made on an Epson RX-680 “all-in-one” inkjet printer. The RX680 targets the home printing market for convenient “do-it-yourself” document scanning, copying, and printing, as well as high quality photo printing. It uses the latest Epson “Claria High Definition” dye-based inks. These inks are claimed to offer improved image quality and image longevity on specified Epson printers and matched Epson papers. 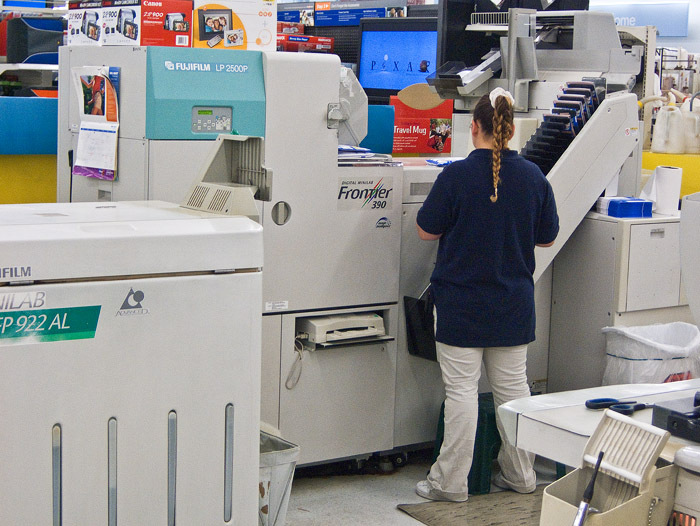 The Fujifilm Frontier 390 and other similar minilabs utilizing silver halide processing technology represent a significant benchmark for photofinishing technology in the first decade of the 21st Century. They became widely accessible to the public at major retail stores across the United States in year 2003. Digital camera sales skyrocketed once consumers finally had a convenient and familiar way to print high quality photos. Digital “wet” minilabs like the Frontier 390 expose a latent image onto traditional silver halide photographic print materials with red, green, and blue laser photodiodes or other modulated light sources. The development of the exposed silver halide crystals into silver particles oxidizes the liquid developer in proportion to the amount of developed silver content in the red, green and blue light-sensitive emulsion layers of the resin coated (RC) paper. The oxidized developing agents in turn react with special color coupling compounds to produce cyan, magenta, and yellow dyes. The silver particles and remaining silver halide compounds are then bleach-fixed and washed out of the print, thus creating a color photographic print. The color image is comprised of isolated cyan, magenta, and yellow dyes protected in a gelatin binder layer. This RC color paper technology is chemically very sophisticated, yet it is what the public has been accustomed to buying for more than 30 years. Color fidelity and image permanence have incrementally improved as the technology matured. The Fujifilm DL 400 “Drylab” processor produces digitally mastered prints on inkjet photo paper. The new Fujifilm DL 400 Dry Lab was announced at the PMA 2008 (Photo Marketing Association) trade show in February, 2008. The fact that at least two well-known retailers in the U.S., Wallmart and Ritz Camera & Electronics, are now actively phasing in the new Fujifilm DL 400 minilab system is clear evidence today that many DL 400 prints will find their way into photo albums and display environments in American homes over the next few years. “DL” in the 400 DL name stands for “dry lab”, and the machine is a joint development between Noritsu and Fujifilm. It also apparently employs inkjet technology developed by Epson. Basically, it is a very fast 720×720 dpi four colorant (CMYK) inkjet printer capable of serving small to medium-volume photofinishing markets. 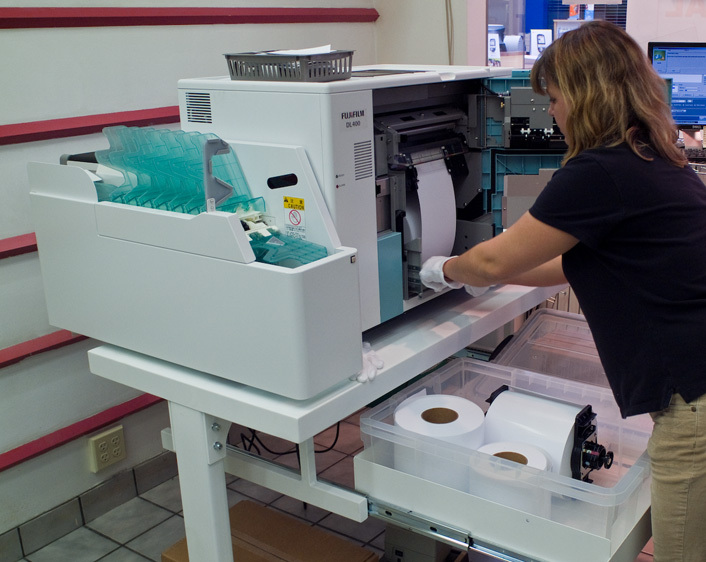 It can be manually switched by the operator between matte and glossy papers in about a minute. The DL 400 can produce 4×6 photos at a rate of about 650 prints per hour. It can also print on rolls as wide as 10 inches and make enlargements as big as 10 x 36 inch panorama prints. Having prints made on both the Frontier 390 and the DL 400 systems is for the most part very easy, but it can also be frustrating at times for an advanced amateur or professional photographer. The challenges to advanced users include defending one’s own image ownership and copyright to store employees if the images don’t look “amateurish” enough, making certain that images from a prosumer or pro level digital camera have been set to or converted to sRGB working color space, and finding store employees that know how to turn off all “auto-corrections” in order to avoid unwanted color and tone edits. That said, most stores are very good about reprinting images if the customer isn’t happy with print quality. For the educated customer who prepares edited digital images on a calibrated monitor (admittedly not a large percentage of the consumer photofinishing market), getting consistent print quality at one-hour digital minilabs often starts by finding the knowledgeable key operator at the store. The key operator knows how to bypass the automatic image “enhancements” at the main computer software interface, thereby setting the machine to its underlying baseline calibration state. Digital minilab baseline calibrations are intended to make the printer’s output colorspace comparable to the industry-standard sRGB working colorspace of typical consumer digital cameras. Improper handling as prints are removed from the processor and packaged for delivery to the customer can cause a surprising number of bent corners or crescent shaped paper creases at local one hour photo labs. Although physical and environmentally-induced mechanical damage can occur to any print media, the Fujifilm DL 400 inket prints are noticeably more vulnerable to physical damage than traditional RC photos. The chosen microporous polymer material along with possible incorporation of additional dye mordant chemistry results in the DL 400 image receiver layer being very brittle. The brittleness in turn makes the image layer quite vulnerable to physical cracks. Not only were cracks observed in some print samples due to improper handling, but the cutting blade of the DL 400 printer also induced fine cracks along one edge of the prints. Over time, especially in climates that have strong seasonal humidity cycling (e.g., cold nothern climates where building interiors are heated during wintertime), brittle print coatings are vulnerable to crack propagation. It takes less energy to propagate an existing crack than to form a new one. Thus, even if no new cracks form, existing cracks in image layers, particularly along the edges of the print, can grow in length over time due primarily to humidity expansion and contraction of the prints. Figure 1. A crease and cracks in DL 400 image receiver layer. Figure 1 shows a raking light photo of a DL 400 print resting on conservation mat board. The corner crease and associated cracks in the image binder layer occurred from improper handling. Note also the cracks along the bottom edge of the print. These cracks were caused by the cutting blade of the DL 400 printer. There is historical precedent for photographs that begin their life cycle with brittle coatings, for example, Polaroid “peel apart” prints and Kodak Dye transfer prints. Both of these historic processes have a strong similarity to modern dye-based inkjet printing because the image formation is by dye transfer and diffusion into an image receiving layer on the paper. Mordants are used to anchor the dyes in place and prevent further lateral diffusion over time that can alter color balance and cause loss of sharpness. A side effect is that mordants can also increase the brittleness of the polymer binder layer. Photographs with brittle coatings can last a long time if carefully handled and strong humidity cycling is avoided, but their vulnerability to mechanical damage and crack propagation is comparatively higher than prints with more flexible coatings. The Epson RX60 all-in-one printer can print high quality photos at home. The one-hour photo finishing experience naturally invites comparisons with the user-friendliness, costs, and convenience of home photo printing at this point in the history of digital photography. 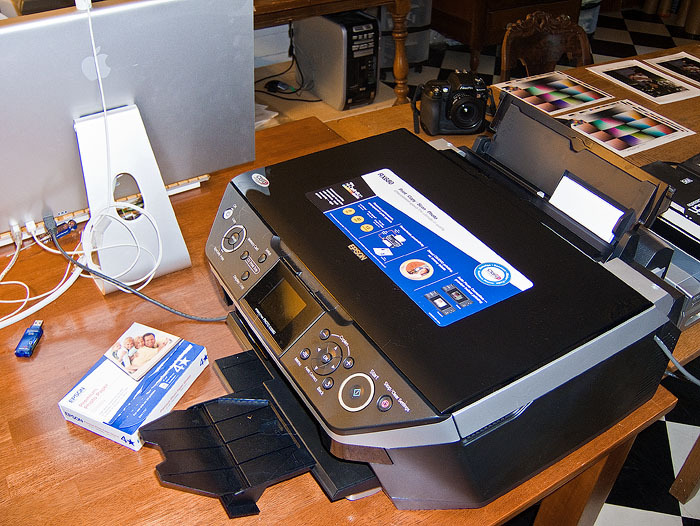 An Epson RX680 was purchased in order to evaluate the overall consumer “out-of-the-box” experience with home photo printing as an alternative to traditional photofinishing. The Epson Claria dye set and HP’s Vivera dye set both represent milestones in inkjet dye stability on carefully matched papers. AaI&A already possesses an Hp photo printer that utilizes the Vivera dye technology, thus the RX680 was selected in order to print with the Claria dye technology. The RX680 prints made on Epson Premium Photo Paper Glossy also exhibited brittle coating characteristics and sensitivity to crack propogation similar to the Fujfilm DL 400 prints. In fact, both inket papers had an amazingly similar look and feel, enough to suspect they might even be the same paper type sold under different labels. However, their back side surfaces confirmed that they are not identical products. “All-in-one” desktop printers have gained much popularity in the last couple of years, and indeed all the major printer manufacturers offer standalone units with built in memory card readers and LCD/menu panels that free the printer from its dependence on a tethered PC. The RX680 serves home office needs for scanning, copying, and document printing on plain paper but can also print on high quality inkjet photo paper as well. LIke most other all-in-ones, the standalone RX680 gains even more functionality when paired with a personal computer. For example, the RX680 can scan directly when making printed copies of existing documents, but it cannot save a digital copy unless tethered to a computer. Also, unlike the Frontier 390 and DL 400 systems, the RX680’s memory card slot appears to only read jpeg files with embedded digital camera EXIF tags. This limitation means that user edited versions of pictures cannot be uploaded to the printer through the memory card slot because image editing software usually strips away the EXIF information. The RX680 software driver also offers advanced color management choices (e.g. Adobe RGB working space, “advanced” color adjustments, “no color adjust” mode for use with ICC profiles, etc.) that are not available on the standalone LCD panel’s menu. The overall “out-of-the box” setup and use of desktop printer software takes some computer literacy not required at the local one-hour photo store. However, using the RX680 in standalone mode is indeed comparable in ease of use to the typical minilab order entry terminal. Although home printing today is currently more expensive when printing 4×6 photos, the costs of many desktop photo printers and their ongoing consumable costs can be quickly recovered if one enjoys making 5×7, 8×10, or larger prints. Printing approximately two dozen 8×10 inch prints on the DL 400 system nearly matched the purchase price of the RX680 home printer (note: the RX680 was discounted with rebate to about $100.00). The RX680 produced over two dozen 8×10 inch prints for this project on letter-size premium photo paper plus numerous plain paper prints and a dozen 4×6 photos. It is still running all of the original ink cartridges included with the printer. Figure 2. A digital image, rendered in sRGB color space and used to make the prints shown in this study. Figure 2 is the digital image that was uploaded to all three printer systems in this study. It was formatted in jpeg format and sRGB colorspace at its native resolution of ~709 pixels per inch (ppi) when sized for a 4×6 inch print. The printer drivers therefore had to resample the image to native printer resolution as is typically required for most consumer digital camera images. Figure 3. The digital image crop used for image macrostructure evaluation. A cropped section of the digital image is shown in figure 3. The cropped portion occupies a 1.0 square inch area in the finished 4×6 prints. Measure its width in inches to determine its final magnification on your computer screen. For example, it will display six inches wide (6x magnification) on an LCD monitor with 100 ppi pitch. Also, note the raster line defects in the lower right corner. Figure 4. Digital file corruption. Figure 4 reveals a very rare example of a Photoshop scratchdisk or file saving error that occurred when the original camera file was edited and saved as a new version in sRGB colorspace for printing. The two line, two pixel-wide flaw went unnoticed until enlarged prints on 8×10 and letter-size papers were made because printer driver resampling for the 4×6 inch prints largely masked the flaw. Figure 5. Scanned print samples compared to original image (top photo). Scanned reproductions from the actual print samples are shown above in figure 5. The 4×6 inch prints were scanned as a group at 600 ppi on the RX680. A small global curve correction was added in Photoshop CS3 in order to reproduce the actual print colors and tones as faithfully as possible on an sRGB calibrated monitor. The final collage including the original digital image was resampled to 100 ppi for this html page view. Figure 6. Image Macrostructure – Perceived sharpness and “grain” structure. The macrostructure of the prints can be compared to the original file data (resampled to 600 ppi for same scale on this html page) in figure 6. The crops are 1 x 1 inches square at each 4×6 photo’s print surface, scanned at 600 dpi on the RX680 scanner. The measured width on your monitor screen in inches is the total magnification at which you are now viewing the print surface. Default scanner sharpening only was applied to all scans. The scans are unretouched. 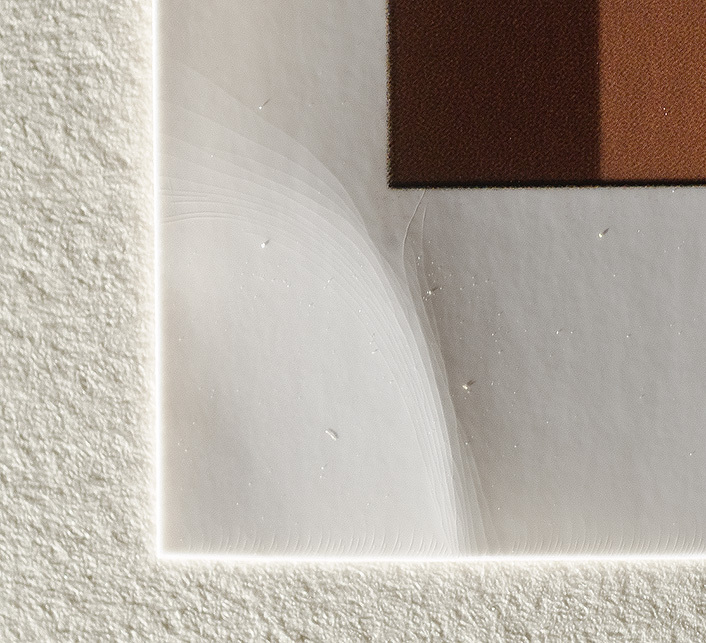 Note: the apparent “dust” on the Frontier 390 print surface is primarily specular reflections caused by its stippled luster surface and interaction with the scanner’s light source optics. It is not an inherent fault of the print because another scanning or digital capture method could have avoided the problem. Consumers usually print photos with customary intentions of sharing with friends and family and also perhaps adding them to a family photo album. However, the history of photography teaches us that these photos often acquire another purpose in years to come. Camera originals become lost or discarded. Only the prints remain, and they become the new “source” image for reprints and enlargements. Digital files and their unique “archiving” vices and virtues are unlikely to change the need for today’s digital prints to serve in the future as important historic documents. This eventual purpose is where image macrostructure becomes important. Traditional light-sensitive photographic print materials had very high image acutance and resolving power. If the camera original negative or slide had the detail, a subsequent print could carry that detail handsomely. In our modern digital age, even with equipment like the Frontier 390 which utilizes traditional photographic materials, the print sharpness is limited primarily due to the image rasterizing technology of the printer and not the print material itself. A digital print that can appear reasonably sharp at normal viewing distances may not serve as a useful source document if additional cropping and enlargement is requested. The DL 400 output is an excellent example of a digital printing system with high perceived image sharpness at normal viewing distances but less than optimal image macrostructure when enlarged scene content must be extracted and reprinted. Figure 7. Image Macrostructure – Resolution of fine details. Consider figures 6 and 7. In rank order of perceived image sharpness by the unaided eye at normal viewing conditions, the RX680 has the highest perceived image sharpness, the DL400 is second, and the Frontier 390 print is third. The rank ordering of the DL 400 and the Frontier 390 is an excellent example in imaging science where the image attributes of sharpness and resolution do not positively correlate. The retention of high frequency spatial details relates closely to system resolving power, whereas better low and mid frequency contrast modulation correlates with image acutance (perceived image sharpness). Sometimes, when comparing two different imaging systems one system can have higher low and mid frequency spatial response yet poorer high frequency response. Examine in figure 7 the inability of the DL 400 to resolve the clothing texture and to render the appearance of the fine hairs in the brown fur patch on the puppy. Compare these same features in the Frontier 390 print. Next, observe in figure 6 how the DL 400 print does a better job retaining the specular “catchlights” in the eyes and the earrings than the Frontier 390 print. In the former case, the Frontier 390 is beating the DL 400 on high frequency detail retention, whereas in the latter case, the coarse ordered screening pattern of the DL 400 is doing a better job preserving mid frequency details such as catchlight reflections in the eyes and the earrings. When observing the prints at normal viewing differences these differences in overall frequency response allow the DL print to appear “sharper” to the unaided eye even though the Frontier 390 print has superior resolving power as evidenced by the preservation of the ribbed texture in the clothing and the fine hair reproduction in the puppy fur. Figure 8. Macrostructure of digital copies with post processing techniques. Figure 8 illustrates the practical outcome of using these prints as source material for further copying and enlargement. The objective in this case was to make a “good effort” to improve the copy print outcome using image processing algorithms typically employed in digital copying and restoration projects. For example, a “dust and scratches” filter was able to remove the white spots from the scan of the Frontier 390 print without losing much sharpness, and additional curve correction amplified shadow details. A “descreening” algorithm suppressed the course dot structure of the DL 400 scan while additional sharpening, color, and tone edits helped to improve the overall reproduction. For the RX680 print, careful tonal edits improved the overall lightness and contrast and imparted a more photo realistic appearance in the shadow regions. This exercise underscores the RX680’s initial image quality advantage of higher initial sharpness and resolving power in terms of providing the best starting point for further copies and enlargements. The caveat, of course, is ultimately image permanence. The initial advantage of one print technology over another will only endure if the tone and color relationships in the image are also retained over time. DL400 – The new DL400 photofinishing technology provides prints that appear equal to or better than the older Frontier 390 technology in terms of color vividness and sharpness at normal viewing distances, but fine detail reproduction is poorer due to the relatively coarse yet highly ordered screening pattern. That DL 400 prints tended to be a little dark was also noted by the employees at the store even when auto enhance was left on. The employees had therefore taken the initiative to routinely add an additional “+5 brightness” correction in the main software. AaI&A’s request to set the machine to the baseline correction removed the +5 brightness correction and the print shown above exhibits slightly dark appearance along with too much yellow and magenta in the overall color balance. At the current time, the baseline calibration of the machine appears to need further refinement, but this situation is probably easy to remedy in the firmware/software of the system. In the meantime, most consumers will have to rely on the key system operators at each retail store to manually “tweak” the output for better overall tone reproduction. An advanced user can compensate with additional custom tone and color corrections according to personal tastes. RX680 – Epson markets the RX680’s inkjet technology as “Ultra high Definition Prints” and the overall sharpness and resolution of the finished prints are indeed superior to the two photofinishing systems evaluated in this article. The RX680 is very convenient and the cost of enlargements is highly competitive even though 4×6 prints are more expensive than typical one hour photo store prices. The RX680 defaults to a “vivid” color mode rather than its available “standard” sRGB-like color mode, but no auto corrections are done without customer knowledge. The print shown in figure 5 was made with this default setting rather than the more accurate standard mode because Epson apparently believes “vivid” is the preferred customer output. It produced a light print with magenta color cast. One subtle deviation from the Epson default settings was in the use of “Photo RPM” highest quality rather than “Best” photo quality. Because the RX680 is marketed as a “high definition print” device, the Photo RPM setting was chosen in this study to maximize the claimed high definition of the printer. The sharpness of the RX680 prints noticeably exceeded both the DL 400 and the Frontier 390 minlab prints. Epson apparently has also concluded that typical consumers routinely view prints under home lighting conditions with low average light levels. The RX680 default settings tend to render a print that is too light when viewed under excellent light levels (500 lux or higher). The lighter prints will indeed be preferred by most viewers when seen under more typical home lighting levels (under 200 lux), but they do not have the ultimate color and tone fidelity achievable when balanced for optimal viewing environments. In particular, the RX680’s shadow rendering is too “open” with a perceptible discontinuity in tone as it transitions from maximum black to deep shadows with color. Discriminating photographers who look for “real photo” quality will find this default shadow reproduction a little disturbing. However, these advanced users can profile this printer in a “no color adjust” mode or simply make some manual image edits that will correct the problem. Hence, the printer is perfectly capable of achieving true photo quality rendering even though it falls short of this mark with its default consumer calibration. Frontier 390 – Due to its digitally controlled “analog” modulation of light source intensity as each pixel location is being exposed on traditional RC photo paper, the Frontier 390 is capable of producing arguably superior continuous tone, but to get the best shadow detail possible, advanced users will want to use ICC profiles or manually introduce some tone and color corrections rather than rely on the default calibration. The default calibration tends to slightly boost contrast at the expense of shadow detail, and the print came out a little dark overall and slightly “cool” in color balance with a little too much cyan. However, the 390’s excellent densitometric calibration method is stable and repeatable which means the customers’ photofinishing experience with this technology is also very predictable over time. Fuji engineers probably concluded that slightly higher midtone contrast is generally preferred by consumers, but again, it comes at the expense of shadow detail. The skintones in the chosen image are part of the darker midtone range of lightness values, and this choice of image therefore emphasizes scene darkening that can go along with a midtone contrast boost. Nevertheless, the 390 output has a very traditional photographic continuous tone appearance with no evidence of banding or posterization. Because the 390’s day-to-day consistency is maintained by its excellent built-in densitometric calibration method, the only thing that may go wrong with color consistency is when employees load new paper or chemistry without taking the time to run the densitometric calibration routine. ICC profiles can reliably be made for the Frontier 390 to improve upon its baseline sRGB rendering and provide even more predictable color and tone reproduction suited to the tastes of advanced users.